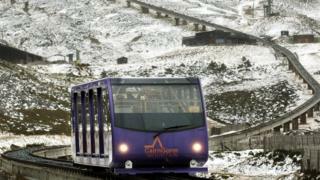 Image caption HIE said the funicular being unavailable for the whole ski season was a "worst case scenario"
A report into a structural problem that has closed the Cairngorms' funicular railway for more than month has been delayed. Highlands and Islands Enterprise (HIE), which owns the railway and the CairnGorm Mountain snowsports centre, had expected the report on 3 December. But strong winds and cold temperatures have hampered work to excavate some of the railway's foundations. HIE said the engineers' report could be delayed by up to two weeks. The railway near Aviemore will remain closed until remedial work has been completed, the enterprise agency confirmed. The agency has previously warned it could remain shut all season, though it stressed this was a "worst case scenario". HIE said, in the meantime, it was continuing with a plan to use snowmaking equipment to provide snow at lower levels of the snowsports centre. The equipment is due to arrive on Tuesday and should be operational about a week later, said HIE.